Ever heard of it? 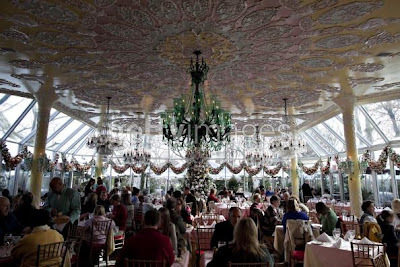 An upscale and unique restaurant in New York's Central Park has closed its doors after 75 years. They filed bankruptcy and the contents will be auctioned off. It appears nothing is immune from the failing economy. When hubby and I went to New York a few years ago we stopped in for lunch. I'll never forget it, because it's the one and only time I spent $18 on a salad. A green salad. You heard me right. I recall looking over at him as we examined the menu. A salad was all we ordered...with a glass of water. 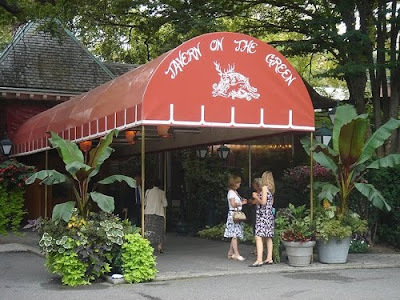 Hubby had eaten at Tavern on the Green before and wanted me to have the experience, and it was apparent from his expression that the prices had gone up some. It really didn't have as much to do with the food as it did with the atmosphere and history of the restaurant. It's been shown in movies like Wall Street, Ghostbusters and The Out of Towners. Frequented by the rich and famous. It's sad when places like that are forced to close their doors after having such a long and interesting history. And I'm sure they aren't the only restaurant that serves an $18 salad. As we say goodbye to another year and ring in 2010 I can't help but wonder what other landmarks we may lose. Let's hope this next year will be better for all. Debbie...I haven't heard of "Tavern On The Green" and I'd like to have more sympathy about it closing but honestly, I don't. Most of us are struggling with basic necessities so I find I don't care. It's a matter of priorities. It's not that I never splurge because I do (tick-tock). I just don't know that there's a compromise when the majority are worrying about trying to maintain basic necessities versus keeping and maintaining a landmark. Maybe it's my age, but there are no landmarks I get excited about ...maybe I never did. I'll be dead in not that many more years and I simply don't care. What I care about is getting from today to tomorrow in good health and good spirits. Yes, I have heard of the them. Sad that they are donw, but sounds like they were too pricy to keep going. I mean when you go on vacation, it's fun to go to new places but not to spend alot just for the name. Its sad that old landmarks get lost as time goes by. We have the same thing happening over here. Really sad. Amen to that Nancy, let's keep our fingers crossed the things are looking up. I can relate to your feelings. I find as I get older material things are less important to me when compared to family, health and making it from one day to the next. Very pricy! Hubby was more interested in sharing some of the history of the place than anything else. You should have seen his face when we checked out the prices on the menue. Hi Tamsyn, where is over here? I have heard of this place. It's always sad to see places like this close their doors.